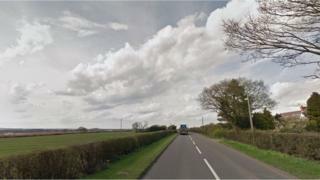 A man and a woman have been killed after their motorcycle was in a collision with a tractor. They were pronounced dead at the scene of the crash in Crickmerry, near Market Drayton, in Shropshire. Their motorcycle collided with a tractor on the A41 shortly after 11:00 GMT on Sunday. The road was closed while police investigated the crash scene and West Mercia Police is appealing for any witnesses and information.